Puerto Vallarta (often referred to as Vallarta or just PV) is known for its friendly atmosphere, so it’s not surprising that it attracts a lot of tourists. Many of the expats you’ll meet here started out as tourists. The ones I spoke to told me they came here on vacation but realized pretty soon that they didn’t want to leave. As soon as they went home, they changed their lives to move here. You can’t get a better stamp of approval than that. But PV’s not just popular with gringos—it’s a favorite destination for Mexicans, too. That alone helps maintain its authentic cultural flavor. So what’s drawing so many people here? Well, first of all, Puerto Vallarta is incredibly beautiful. The majestic ocean—with its long sandy beaches splattered up and down the coastline—stretches as far as the eye can see. The thoughtful architecture of the city complements its natural beauty. Traditional Mexican buildings blend with modern and abstract designs, while palm trees and exotic flowers grow abundantly on its cobble-stoned streets. It’s an easy city to navigate, too. Because Puerto Vallarta is relatively small with a population of 250,000, transportation is quick, inexpensive, and efficient. A bus from downtown Old Vallarta to outlying suburbs where there are malls (including Walmart and Costco), modern hospitals, clinics, and universities, only costs 50 cents. Take a taxi and depending on how well you can haggle, it will only cost between $5 and $8. And if you need to fly somewhere, Puerto Vallarta has its own international airport, making it convenient to North American destinations. 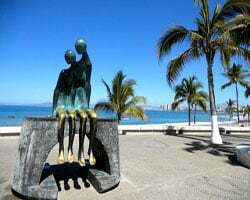 The half mile malecon (boardwalk) that borders the beach from Old Vallarta to the Zona Romantica is a fun place to stroll and offers a great mix of activities and art, against one of the most beautiful backdrop views of the Pacific you’ll ever see. Puerto Vallarta is also an art mecca that offers weekly art walks. As you walk the boardwalk, you’ll pass 15 life-size sculptures depicting local history and culture by famous artists. The smells wafting from the many restaurants and food stalls selling everything from smoothies to fish on a stick are hard to resist. You like people watching? This is the place to do it. As the sun starts to go down, you can find a quiet place on the beach to watch the sunset, then go to one of the many piano bars, bass-thumping clubs, or salsa bars to practice your Latin dance moves. What about safety? We’ve all heard stories about the dangers in Mexico…but you don’t need to worry in PV. Puerto Vallarta has been deemed one of the safest destinations in Mexico and the locals will tell you it’s safe to walk almost anywhere in the city on your own, day or night. That’s partly due to the abundance of tourist police on nearly every corner downtown. And, geographically speaking, because Puerto Vallarta is located on the Bay of Banderas, there is increased protection from natural disasters like tsunamis and hurricanes. That all might sound great for a vacation…but what about as a full-time retirement destination? Well, when I was there scouting it out, I made sure to research how much it costs to live in PV. And I heard about some great deals. With its incredible beauty, thoughtful architecture, and low cost of living…Puerto Vallarta, Mexico is a great place to relocate overseas. The owner of the local tacqueria that I like to frequent (two tacos cooked fresh in front of you with the ingredients of your choice and a freshly squeezed orange juice all cost just $4, by the way) said he could find me a one-bedroom apartment in the suburb of El Pitillal, a 20-minute bus ride from downtown, for just $200 a month. Wandering around El Pitillal, you’ll rarely cross paths with another gringo. It’s like old Mexico, with traditional small tacquerias, tiendas and lavanderias. If you prefer to live in Old Vallarta (downtown), where there is more action, I discovered you can rent a one-bedroom apartment for $400 a month. Living in this area you’re more likely to spend time eating out, but a light dinner including a fresh garden salad, ceviche (presentation is of Food Network calibre), and a glass of wine need only cost $8. Or go with friends for a breakfast of French toast with candied pecans, orange juice, and coffee on one of the beachfront restaurant patios for $7. Spend $20 at the local grocery store and you’ll have enough veggies, pasta, fresh cheese, yogurt, papayas, and fresh oranges (to squeeze for your morning juice), to easily last you for a couple of days. Tourism has meant that locals are making things like fresh granola, and imported foods are easily available, but that will quickly drive your monthly expenses up. Of course, the sky’s the limit with respect to both your accommodation choice and lifestyle, but your lifestyle in Puerto Vallarta—and your budget—can easily be tailored to your interests and your income. Clearly, Puerto Vallarta has not “been done” yet.